Italian Mannerist Sculptor, Painter, Designer: Fontainebleau School. One of the most famous Mannerist artists, the French sculptor Francesco Primaticcio was also an architect and interior decorator, who became leader of the first Fontainebleau School, a style of decorative art named after the royal palace of the French King Francis I. Together with Rosso Fiorentino, a master of Mannerist painting, Primaticcio was the most important artist to work on the decoration of the palace, and became one of the creators of the distinctive style of French Mannerism. Unfortunately, few of Primaticcio's works remain. His main contributions can be seen in the painted, high relief stucco decorations at the palace, while he is best known for the palace's Francis Gallery (1533-40), which exemplifies a type of cinquecento interior decoration involving painting, plasterwork, and sculpture. Born in 1504 in Bologna, Primaticcio first trained under the painter Innocenzo da Imola (1485-1548). Imola was highly influenced by colour and excelled in painting frescos. He passed his experience and passion for decoration onto his student. Later Primaticcio went on to apprentice in the workshop of Bartolommeo Ramenghi (nicknamed Bagnacavallo and himself a pupil of Raphael). He additionally studied Italian Renaissance sculpture and painting under Giulio Romano (1499-1546, also a prominent pupil of Raphael), learning how to sculpt and model. He assisted Romano on the decorations of the Palazzo del Te, Mantua. Primaticcio returned to Rome for a couple of years after this, to purchase artworks for the King. He bought a considerable number of classical sculptures and statues, which were re-cast and placed in the gardens of Fontainebleau, setting a trend for Greek art throughout France. He went on to decorate other parts of the palace, including the Cabinet du Roi with a series of paintings, now lost. He depicted his figures in paintings with exaggerated, elongated figures, and this style would influence French painting for the remainder of the 16th century. In 1543, Primaticcio worked on the bedchamber of the duchesse d'Etampes (the King's mistress), painting scenes from the Life of Alexander the Great (these works survive today). 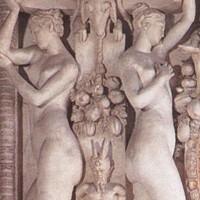 The mythological scenes are decorated with highly carved reliefs of lithe, slender adolescent female figures. The elongated and voluptuous bodies are surrounded by garlands. During this period he also worked on the Galerie dUlysse (154170, now destroyed) and the Galerie Henri II (restored). He employed foreshortening and illusionist tricks in his figurative work which created beautiful effects. Primaticcio's skill in sketching however is less admired - he sketched plans for an infinite number of works of sculpture, ornamentation, goldsmithing and fine French furniture - but his drawing is often incorrect. His style is mannered and his figures lack energy or character. However, the patronage of the Duchess of Etampes, ensured that criticism was kept to a minimum. He was appointed Superintendent of Royal Construction in 1559, which meant he was able to exert something of an artistic dictatorship during the period. To learn how to judge plastic artists like the French Renaissance sculptor Francesco Primaticcio, see: How to Appreciate Sculpture. For later works, please see: How to Appreciate Modern Sculpture. The Holy Family with Saints Elisabeth and John the Baptist (1541-43, The Hermitage, St. Petersburg). This painting was formerly attributed to Parmigianino, then Pontormo and later to Tibaldi, before finally asserting that Primaticcio was the more likely artist. Ulysses and Penelope (c.1545, Toledo Museum of Art, Ohio). Ulysses lies in bed with Penelope and a group of small figures are crowd in conversation in the distance, recalling qualities of the artist Rosso. The painting was probably originally a panel for the Galerie d'Ulysse in Fontainebleau. Primaticcio died in Fontainebleau in 1570. Although his colleague Rosso Fiorentino is sometimes credited with introducing France to stucco work, the 16th century Italian art historian Giorgio Vasari (1511-74) wrote: "the first works in stucco that were done in France, and the first labours in fresco of any account, had their origin, it is said, in Primaticcio". Primaticcio's figures and designs were elegant, owing a certain amount to classical origins. He managed to mesh several themes and styles, subduing the 'violence' of Italian Mannerism and imbuing it instead with a quiet, characteristic French elegance. His distinctive figurative relief sculpture employed elongated limbs, small heads and sharp elegant profiles, and became the absolute fashion in French art until 1700. Note: The Second School of Fontainebleau refers to the series of late 17th-century painters and sculptors who were commissioned by the French king Henry IV (1589-1610). Led by Ambroise Dubois (1542-1614), Toussaint Dubreuil (1561-1602) and Martin Freminet (1567-1619), it lacked the creative brilliance of Primaticcio's era.